Things are still a bit crazy over here. My new office is setup for the most part though I still don't have a ways to go. I'll be more settled once I finally get a desk. 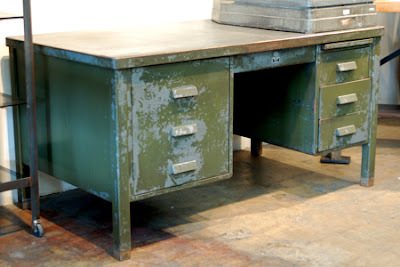 I'm on the prowl for a vintage tanker desk. 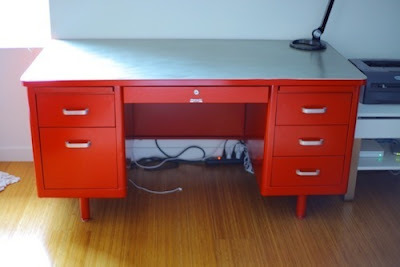 Every time I see one I think of old movies and rooms full of secretaries clicking away on typewriters! 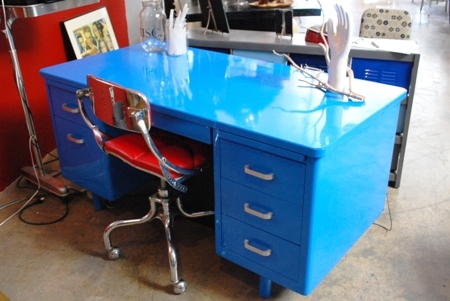 I've always been in love with tankers and now that I finally have the room for one, I won't rest until I have the desk of my dreams! 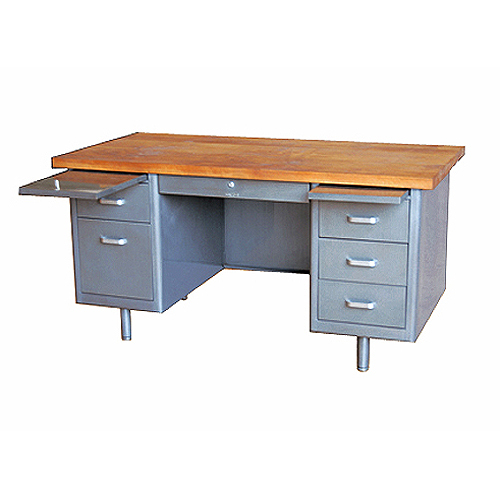 The bad part is, these desk are made of steel which makes them EXTREMELY HEAVY. Plus restoring them is a very time consuming process. The good part is, because they're so heavy, you can find tons of people selling them for cheap or giving them away for free on craigslist to the first person who can move it out of their house. Major score! Hopefully in just a few short weeks I'll have a new, brightly colored tanker desk. I haven't decided what color I want. I've considered kelly green, bright yellow, orange, and deep pink. I've also thought about restoring it to its original grey. What do you think? The easiest way to restore a steel desk is to have it sand blasted and powder-coated at an auto body shop. The bad part is that this can cost a few hundred bucks which is why I'll be doing my paint job on my own. Wow, what a tough decision! All of those desks look amazing. I'm a huge fan of color and would have a hard time deciding. Although, if you went with grey, it would be easier down the road to change your room and accesory colors. I hope you'll keep us updated and post pics when you get your desk. Wow! cool renovation huh you made it look new again! Thumbs up! Garden Forum, you give me too much credit! I haven't even found my desk yet, let alone done as great of a job as the people who refinished the desks pictured above. Hopefully mine turns out at least half as good! I am currently renovating a Tanker desk. In my craft/sewing room I have a set of lockers that my sweet hubby painted copper using automotive paint and a spray gun. It came out fabulous! I also have a bright red locker entertainment center that I am using to store my fabrics and my walls are a deep blue/grey color. Since i already have so much color and this will be my sewing table for years to come, I have decided on an automotive paint in Champagne. My husband and I will also be topping it with copper pennies. I wish you the best of luck on your Tanker desk adventure! That sounds awesome! I would have used a sprayer if we had the outdoor space. Maybe we'll give it a try for our next project! You should send pictures of your pieces, I'd love to see how they turned out!